InciNotes™ makes requesting National Weather Spot Weather Forecast as simple as point and click with your finger. InciNotes™ Spot Weather Request fills out the form from your weather readings taken for the incident. Then with a finger click on submit it send the Request For Spot Weather form to the closet National Weather Service office that can provide a Fire Weather Spot Forecast. It’s just that simple. This eliminates the need to go through your dispatch office. 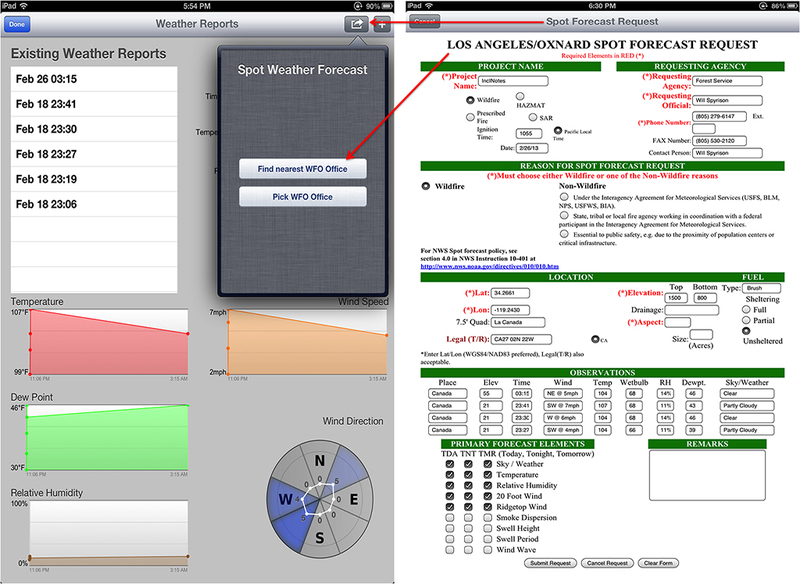 The National Weather Service will send the Spot Weather Forecast directly to your iPad once it is completed. This will give the Incident Commander real time support from the National Weather Service.